Think of a workflow as being a pipe. Data and documents are falling down that pipe and you can make clever decisions about what's going to happen to those documents. Whatever needs to happen to your document can be automated. The drag and drop interface lets you easily create and manage document workflows that fit your organisational logic. Trigger processes from any entry point. Images, dynamic graphics, data from print streams, databases, XML files or any other text based format stored anywhere, can be read by PlanetPress and easily mapped onto a document. We know, it's pretty cool. Objectif Lune’s development philosophy is all about freeing our customers from captive environments. That's why PlanetPress is built as a toolset that you can customise. Being adaptive and customisable is what this software is all about. The PlanetPress workflow tool offers numerous easy to use built-in objects to simplify connecting to, and communicating with, almost any enterprise application. Of course, if you need any help, we have a pretty awesome support team available as well as comprehensive online training. Too often systems in place (CRM, ERP or Financial) offer very limited options when it comes to extracting or printing the data they contain. Data adds value to your documents but sometimes that data is scattered throughout multiple systems. Often times, they are unable to communicate with each other. PlanetPress Connect not only optimises your documents’ content, it maximizes the speed of your printer. Instead of sending two different documents PlanetPress Connect helps to reduce the number of pages you print by selecting only the relevant content for each customer. Turn invoices into advertising vehicles by adding personalised content to transactional documents. Bonus: Save on postage. PlanetPress Connect easily integrates with third party solutions to help pre-sort and cleanse mailing addresses as well as to group multiple documents to the same customer. This often saves you money once you get to the post office. Do you have large print jobs to run occasionally? Maybe you already have a couple of printers installed and don't want to invest in a large-scale printer? 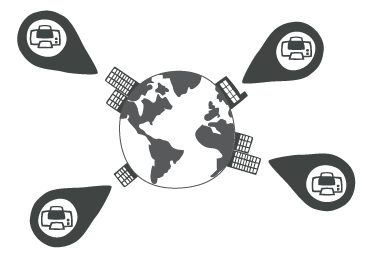 Use PlanetPress Connect's load balancing capabilities to send equal or variable sized parts to each of your printers or output engines. Stop sending work to one machine and clogging it up for a long time. Depending on a set of priorities you can even program the software to send print jobs to whichever machine is free. Distributed printing is about getting everybody what they need more efficiently. 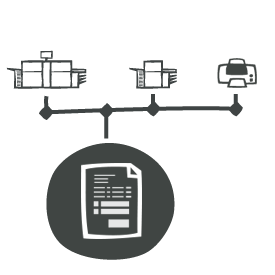 You can print an invoice and a personalised cover letter at sales headquarters, add accounting copy from your accounts receivable department, generate a packing slip and shipping label at your warehouse and send an email confirming the order, all from the same data stream you currently use to print invoices. Eliminate expensive pre-printed forms with print on-demand. Correcting a phone number, adding an email address, or changing a logo used to be a headache when dealing with printed stationery. With PlanetPress Connect, simply open the appropriate form in the designer tool, modify and save your changes. 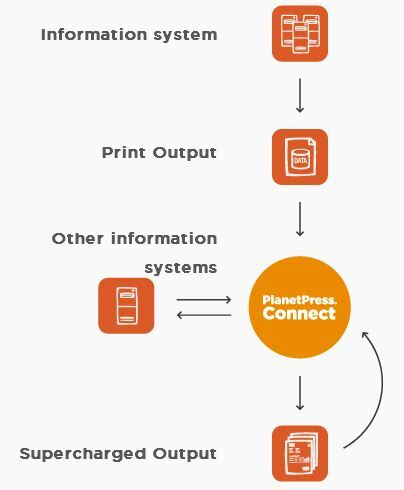 With PlanetPress Connect Workflow tool, you can reduce the number of pages you print by printing only the information relevant to each recipient. You also get to dynamically add personalised messages to existing documents so you don't need to print new ones. Of course, printing on both sides of the page (duplex) is supported. The best part of automating the tasks of scanning, archiving, and mail preparation is that you get your team back. Now free their time from manual repetitive work and allow them to do more creative, fulfilling, and relevant tasks. PlanerPress User Case Study - E-billing that gets you! This site is owned and managed by Open Seas (UK) Ltd with PlanetPress Connect content recreated with the express authorisation of Objectif Lune. Open Seas are an official Objectif Lune Reseller partner in the UK.